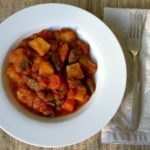 A recipe for a hearty stew with beef, potatoes, tomatoes, and carrots. Season the beef with salt and pepper. Heat the bacon fat in a medium dutch oven or similar pot with a tight-fitting lid over medium-high heat. Cook the beef, in batches, until browned and transfer to a plate and set aside. Lower the heat to medium and cook the onions and celery until soft and translucent. Add the tomatoes, tomato juice, and soy sauce to the pot and stir to combine. Add the beef back to the pot and stir. Bring it to a boil, cover, turn the heat to low and simmer for 1 hour. Peel and chop the carrots into bite-sized chunks. Add the carrots to the pot, stir, cover, and simmer for 45 minutes. Peel and chop the potatoes into 1-inch cubes. Add the potatoes to the pot, stir, cover, and simmer for 45 minutes or until the potatoes are soft. Add additional salt and pepper to taste.